This Presidents Day, let's take a moment to reflect on what it means to be an American. God bless America! Today we honor all of the great men who have given so much of their lives to lead our country. Hope everyone enjoys their Presidents Day. Happy Presidents' Day! Remember the original 'makers' of America, and try to live out their legacy of honesty, integrity and hard work! Today we pay tribute to the men who have served as President for their leadership and sacrifice, wishing you all a happy Presidents' Day! On this Presidents Day, how many citizens will honor those past greats who deserve our respect + gratitude for their decency. Today is Presidents' Day; a day we set aside to honor the great leaders of our past. Although it's called 'Presidents' Day,' this day is to honor George Washington's Birthday! Presidents Day should be a chance to remember and honor greatness. Today is Presidents' Day. We honor all 44. That works out to slightly less than 33 minutes per president. In USA, every third Monday of February is celebrated as President's Day. President's day is celebrated on the same day as Washington's Day. Both Washington and Lincoln were born in February. President's Day is a US Federal Holiday. These days, it is recognized as a holiday when many stores, especially car dealers hold sales and offer discounts. Earlier, corporate practices were closed on President's Day. But now, colleges and universities have their classes and operations, public transit systems remain open and majority of the businesses remain open on President's Day. 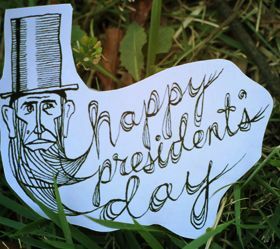 President's Day as well as Presidents Day is used to denote the name of the holiday. Both the variations can be used as per as manual and dictionaries. The President's Day or Washington's Day is celebrated in the honor of George Washington, who is known as "Father of the Nation". Washington is celebrated for the pivotal leadership role that he played in the foundation of USA.